Uttarakhand is located at the foothills of the Himalayan mountain ranges. The northern-most hill state has almost all geo climatic zones which provide commercial opportunities for floriculture and horticulture. The state is home to more than 175 species of rare medicinal, aromatic and herbal plants. Hailed as ‘DevBhoomi’ which literally means ‘God’s Land’, the ‘Char Dhams’ – four most sacred Hindu temples of Badrinath,Kedarnath, Gangotri and Yamunotri are nestled in the mighty mountains. Every year, the state is a host to about 2 crore pilgrims who come to pay their respects in the holy shrines. The presence of the floating population puts a huge burden on the fragile ecosystem of this disaster prone region. Over the years, crass urbanisation due to the annual influx of tourists in these parts has resulted in encroachment of the embankments and rampant multi-storied construction in route to the shrines. Moreover, the strewing of garbage and wastes which clog the rivers had led to a disastrous effect on the environment. Such environmental apathy has made the once scenic region more vulnerable to nature’s wrath. In fact, the flash floods in June 2013 and recurring landslides were akin to a Himalayan tsunami resulting in the loss of lives, property and livelihoods of thousands. In spite of its natural wealth, the region is backward and underdeveloped. The local population is extremely poor; access to proper education and nutrition is abysmal. With no hospitals or primary health centres, the rural folks have to fend for themselves and are exposed to the vagaries of extreme weather. Natives make a living through petty jobs as porters, drivers and construction workers, among others. And during winter, most of the able men are without jobs as harsh climate force them to stayindoors. Due to abject poverty in rural pockets, the youth migrate to cities in large numbers in search of employment. But the people of Uttarakhand are hardworking and have a hunger to make their lives better. Uttarakhand has a huge potential for sustainable growth without harming the environment. 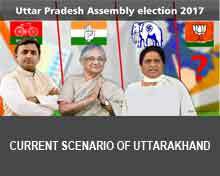 The people have the will and right attitude to make Uttarakhand one of the developed states of the country. The key to sustainable development lies in opening up employment opportunities to the much neglected people in Uttarakhand villages. At present, agriculture is the primary occupation of the people. However, the government is successful in roping in investors with fiscal incentives and tax sops to set up an industrial base which is steering the people away from poverty and backwardness. Focus has to be on technologically superior means for wealth generation. Apart from expanding higher education, the state is on the right part of opening centres of skill training to provide vocational jobs to large number of workforce. Sunrise industries such as those involving bio/nano tech sectors are beingpromoted which give manifold returns on the investment made. Uttarakhand will grow rapidly only if the wealth generated here is kept within the state and is used to improve the standards of the local population. 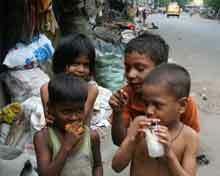 The state has a youth population of about 25 lakhs. The young brigade needs to be empowered with superior knowledge and skillsets for bringing about the transformation of Uttarakhand. At present, the government has charted a holistic development plan through quality education, proper nutrition and healthcare which will ensure wealth creation in Uttarakhand. The state has close proximity to the national capital Delhi, a leading market of the country and excellent connectivity with neighbouring states. Uttarakhand has abundant natural resources due to hills and forests, which further support tourism. Its agro-climatic conditions support horticulture-based industries. The vast water resources available in the state are also favourable for hydropower. Uttarakhand is one of the fastest growing states in India, thanks to the massive growth in capital investments arising from conducive industrial policy and generous tax benefits. The GSDP has increased at a growth rate of 15.32% from 2004-05 to 2014-15. At current prices, the GSDP of Uttarakhand was about $23 billion in 2014-15. The state offers a wide range of benefits in terms of interest incentives, financial assistance, subsidies and concessions. Uttarakhand has a growing social and industrial infrastructure, virtual connectivity, over 38,680 km of road network, two domestic airports, 345 km of rail routes and an installed power generation capacity of 3,177.27 megawatt (MW). On June 16, 2013, Uttarakhand witnessed one of the most devastating natural calamities in the form of flash floods, cloudbursts, torrential rain and huge landslides that lasted for multiple days. The official death toll stood at 5,700, most of them pilgrims who were visiting the hill state as part of annual yatra to places like Kedarnath, Badrinath and Rishikesh. The disaster was a man-made tragedy, a direct consequence of plundering a fragile mountain range like the Himalayas. Repeated warnings of the various environmental research agencies that Uttarakhand is an ‘eco-sensitive’ zone and court mandates on construction in this area were completely ignored. To promote this popular tourist route, illegal constructions of hotels, new roads cut into the mountain range to accommodate the increasing traffic, and unscientific construction of hydro-electric power projects continued unrestricted. The brutal violation of nature through illegal constructions and new roads continuously plied by heavy vehicles had unleashed the ire of nature that culminated in the form of the Uttarakhand disaster resulting in the loss of thousands of innocent lives. Immediately after the tragedy rescue operation ‘Surya Hope’ was kicked off with the Army mobilising its troops and resources to rescue the stranded pilgrims on mountain ranges.The IAF, the Army and the ITPB personnel were pressed into emergency service and they undertook dangerous missions to save the stranded pilgrims at many places. But as time dragged by, the rescue and the relief operations dwindled to almost nothing. The devastations caused by this man made natural disaster are so vast that Uttarakhand needs to be built from scratch. The complete rehabilitation of the affected population may take years as many villages were wiped off in the flash floods. The pathetic sight of survivors in flood ravaged areas only goes to show the extreme wrath of nature's fury which unleashed its gory death of dance against the crass urbanisation of the scenic hill tops. 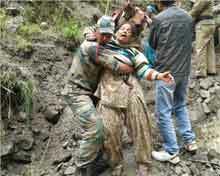 Some of the worst affected districts are Chamoli, Rudraprayag, Uttarkashi and Pithoragarh. 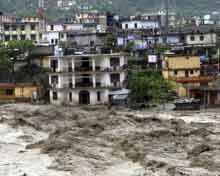 Roads, villages and traumatised families still bear the tell-tale marks of flash floodsthat shook Uttarakhand on that fate day of 16 June 2013. Uttarakhand is well known for the mass agitation of the 1990s that led to the formation of the Chipko environmental movement and other social agitations. Though primarily a livelihood movement rather than a forest conservation stir, the Chipko agitation went on to become a rallying point for many future green activists, environmental protests, and movements the world over. The peaceful, non-violent protests by Uttarakhand villagers created a precedent for similar silent rallies and movements on a global scale. Chipko movement stirred up the civil society in India, which began to address the issues of tribal and marginalised people. So much so that, a quarter of a century later, it was remarked the people behind the “forest satyagraha” of the Chipko movement as amongst “100 people who shaped India”. 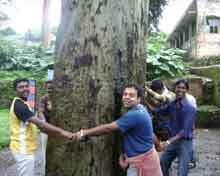 One of Chipko’s most salient features was the mass participation of female villagers. Both female and male activists played pivotal roles in the movement. Gaura Devi was the main activist who started this ecological movement.Later on other towering personalities including Chandi Prasad Bhatt, Sundarlal Bahuguna, and Ghanshyam Raturi joined the Chipko mass stir which became a global torchbearer for protecting the environment.